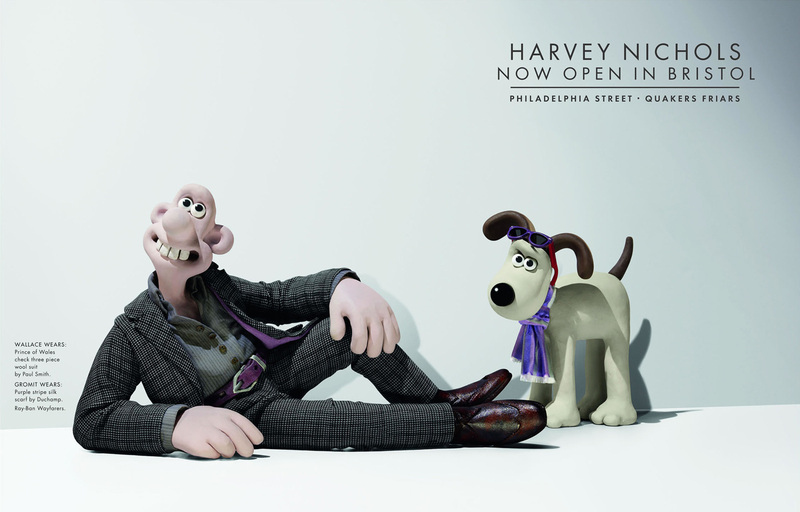 British fashion chain, Harvey Nichols called on well known claymation heroes Wallace and Gromit, along with their companion Lady Torrington, to announce the opening of the Bristol Store in 2008. Wallace the man, Gromit the beagle, and Lady Tottington the woman, are creations of Nick Park at Aardman Animations who are based in Bristol. 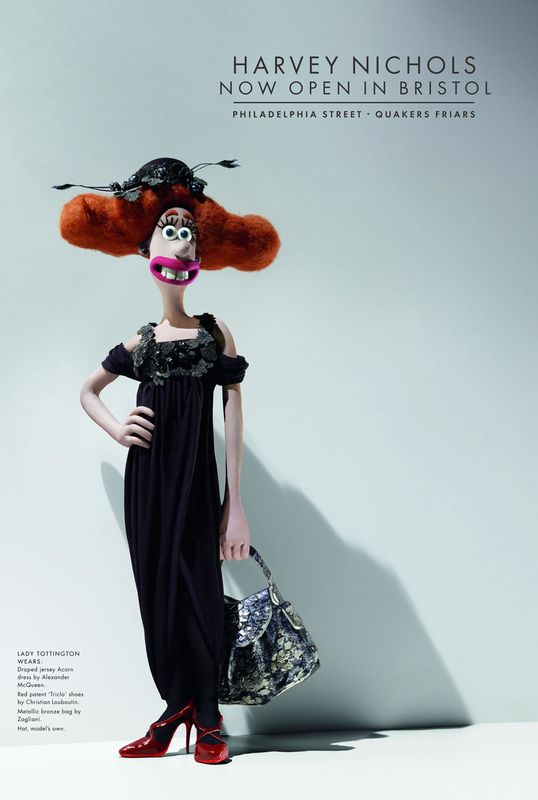 The campaign, Wallace in Alexander McQueen & Gromit in Paul Smith, Wallace in Paul Smith & Gromit in Duchamp, Lady Tottington in Alexander McQueen, won the platinum honour award at the Creative Circle awards in March 2009, along with a suite of gold awards. 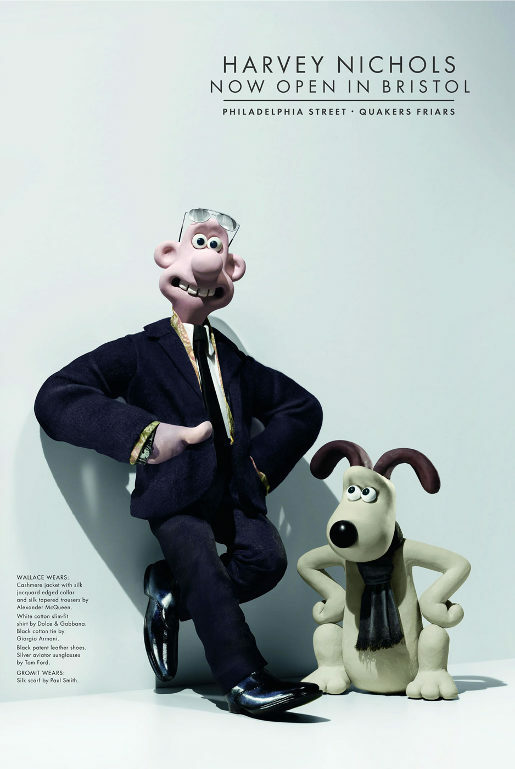 Wallace is seen in a woollen Prince of Wales check grey two-piece suit by Paul Smith while Gromit wears a pair of Ray Ban wayfarer sunglasses and purple stripe silk scarf by Duchamp. Lady Torrington seen wearing a black draped jersey ‘Acorn’ dress by Alexander McQueen, red patent ‘Triclo’ shoes by Christian Louboutin and metallic bronze ’Puffy’ bag by Zagliani. Wallace wears navy cashmere jacket and silk tapered trousers by Alexander McQueen, Dolce & Gabbana fitted white shirt and Giorgio Armani tie. Gromit wears navy silk Paul Smith scarf. The Wallace and Gromit campaign was developed at DDB London by creative director Jeremy Craigen, creative Grant Parker, typographrer Pete Mould and photographer Giles Revell, using characters designed at Aardman Animations. The campaign won the Platinum Award, and Gold honours for Best Newspaper Campaign, Best Poster Campaign, Best Newspaper Advertisement, Best Poster, Best Portrait Poster, Best Landscape Poster.